Yeah, it was Bounty Hunter event against the studio manager of Turn 10 (Alan Hartman). Yes, my mistake, eyes moving too quickly - I had marked the XFR for May 8th but it was indeed the XKR in that set; no instance of the XFR so that can be crossed off. I have discovered my problem with the speciality dealer. When I started the game last October there were 750+ cars to acquire. I now have over 800+ cars but still have a couple that I need to buy. This week's dealer offered this car 1971 Ferrari #2 Ferrari Automobili 312P (408,000 CR) +952 which I purchased as it didn't state that I already had it. When I checked my garage I found that I did have it but with a different PI, everything else is the same. My question is - does this count as a unique car or have I bought a duplicate? Duplicate. For whatever strange or nonexistent reason, T10 decided that the specialty dealer shouldn't show if you already have one. If you are not sure, you have to check each one manually before purchase. Same is true for Forzathon or Career prizes. They're numbered so they're "unique", in a way. It'd be awesome if each rotation had unique parts to each car, like a unique engine swap or something, but you can bet people would rage if they found out! Biggest thing from FH4 I miss in FM7 are the new engine swaps (BMW V10 for example). If you had already in the past purchased this 1971 Ferrari #2 Ferrari Automobili 312P from the SD, then today you would not have had the opportunity to purchase it again. But, since you had this car in the garage not from the SD, therefore, it was offered to you for purchase in this week. The SD system believes that these are different cars, as they have different collector's scores. It's yes and no at the same time. As I said above, that the SD system believes that these are not duplicates, as they have different collector's scores. So, If you are interested in additional collector's scores, you can also consider these cars as not duplicates. But, if you are not interested in additional collector's scores, then you can consider it duplicates. In this case, I recommend you to check your garage before buying cars from the SD. P.S. English is not my native language, but I hope I have explained more or less clearly. Duplicate. For whatever strange or nonexistent reason, T10 decided that the specialty dealer shouldn't show if you already have one. If you are not sure, you have to check each one manually before purchase. You can check it easily inside the SD screen. When you click on the car to buy it, a popup window shows up. Inside that popup window there's the 'Collector Score'. When you already have the standard car, but not the car from the SD it shows you the delta (like 60+6 - the standard car has 60 and you gain an extra 6 with the SD car). When you don't own the car yet at all, it shows you +66. When you already own a SD version of the car from an earlier run it will show you +0 inside that popup screen. Is this new ? Otherwise it's not true. I bought every SD car in 2017 multiple times (like the Pagani 4-5 times) with every new opportunity and flipped them months later for ridculess money in the AH. It's a new 'production run' with every new offer, and the car # starts from 1 again. You can only buy it once while each run, but multiple cars were offered 4-5 times until now. Hmm, it's weird because I sometimes tried to buy the same cars at different times from a special dealer and couldn't. But, I won't argue with you, there is a possibility that I tried to do it twice in a week. Sometimes I have a lot of work to do and days and weeks get confused. So I apologize if I was wrong. Yes, I absolutely agree, this method is the most correct and simple. I think I have it sorted it my head now. But this only applies to Range Rover, which were on the first two sales from the SD. 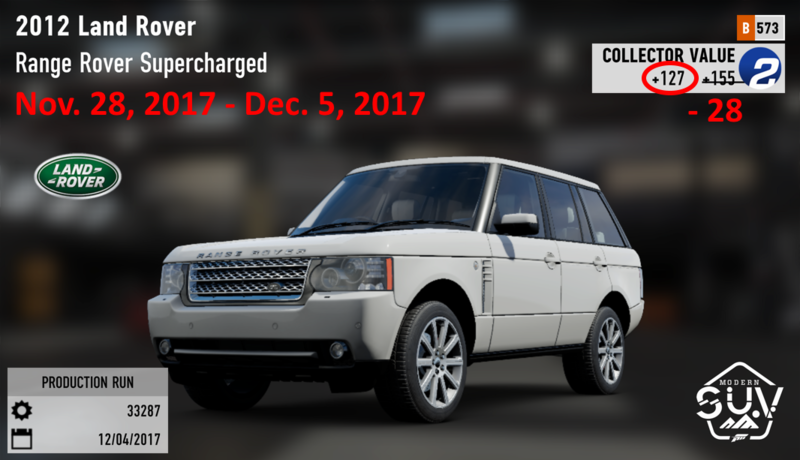 For all the time this Range Rover was on sale at the SD three times, and only by the 3rd time they corrected the error and the value was 171 scores. After that, I decided to compare the scores at the collector's screen, in the carshop and in my garage. I checked all the cars and say in advance that the collector's screen and the carshop have the same values, but in the garage is not always the case. Below I have compiled the list of the cars that can have different values, the first value I specify from the collector's screen (and from carshop) and the second value is the alternative number of scores that the car can have. I can't explain why this is so, but for example in my garage all Hoonigan cars had +25 points, and in the carshop it is +50 points. In the end, I sold my Hoonigan cars and bought the same cars in the carshop, in order to increase my collector's scores. If you have to buy some cars at the auction house from the list below, be sure to pay attention to the number of scores. Update: Have increased my Collector Score by 345. Sorry, didn’t keep count of cost, was probably circa 2 million. BTW, I have a SD collection 2012 Land Rover Range Rover Supercharged value 171 purchased 4 May 2018. Many Thanks for the above. Thank you, I'm glad if it was useful to you. BTW, I have a SD collection 2012 Land Rover Range Rover Supercharged value 171 purchased 4 May 2018. Your RR from the latest SD sale, but I bought my RR at the auction house and judging by the information plate it was purchased by first owner from the very first SD sale. Apparently then they made a mistake, but then they fixed it. Thank you for this information, as it means that I have a chance to get this RR with a lot of points, I hope that I can find one at the auction house. These are all first-timers at the Specialty Dealer. 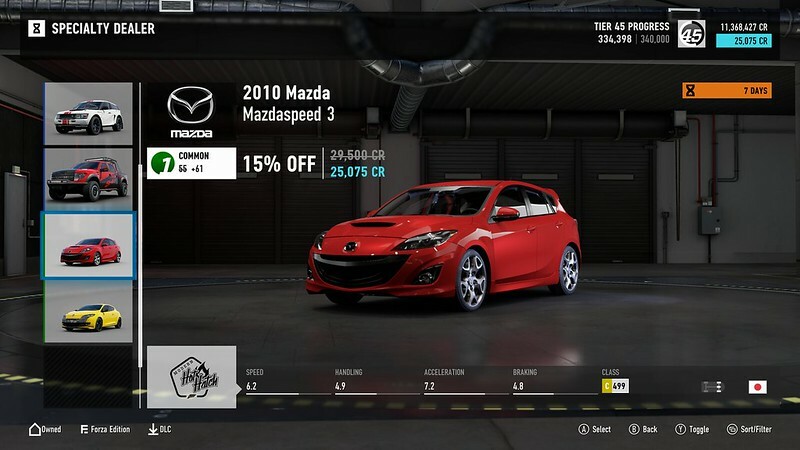 Prices are 15% reduced from the Buy Cars menu, with a 10% increase in points. LSD51ZEN -- Thanks for posting. I had done a sweep a few months ago, but thanks to your list, I found 3 that I had missed. Most likely it'll be a reward for some event in the future like Forzathon, Leagues or Bounty Hunter. In other words, SD does not practice selling FE-cars. But who knows, maybe things will change. I'm glad that helped you. But I'm sure there are a few more cars that may be of more value than what's shown on the collector's screen. When I find them, I will add them to the list above. P.S. For example yesterday I added 1957 Maserati 250F. On the collector's screen and in my garage it only had +50, but at the auction house I found it with a value of +900. As a result, I increased my collector's scores by +850. If you've noticed, most cars that may have an alternative value are cars from DLC and Carpacks. You can see them in the game if you pass to: Progress --> Marketplace -- > Cars. I'm not saying all these cars can have an alternative value, but most of them. But I don't know why that is. You can only exclude cars from Formula Drift Carpack and Hot Wheels Carpak, I'm pretty sure it's always +50. All other cars from the Marketplace (DLC & Carpack) remain under suspicion, except those on my list (because I've already check them and they can definitely have different values). I also missed the 2016 Honda FE, but the Escalade FE I got for the Level Up. Don't worry, we'll get our 2016 Honda FE sooner or later. With today's content update the SD UI now shows the Buy Car price and the 15% discount price. 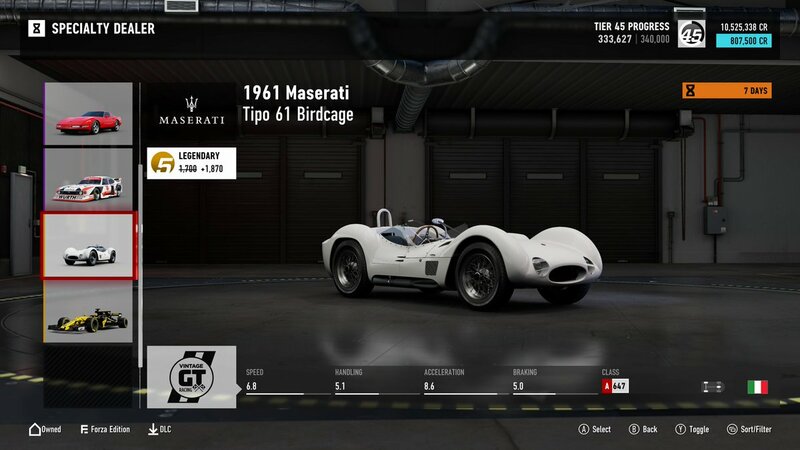 Although there is no icon indicating you already own a car, and the confirmation message no longer indicates that you've previously collected that model, you can tell if you own the car by the the Collector Score; if it's smaller than the number in the main window then you know you own the car already. For instance, if you haven't collected the Bowler then your score will go up by the full 176 points. If you have collected it already, then buying the Specialty Dealer car will only increase your score +16. Don't know if this idea's been thought of, but it would be cool if some cars sold in the SD came pre-fitted with aftermarket bumpers/bodykits, spoilers and rims (that are already in the game for the cars), and were finished off in some sort of design selected by T10 from the community. Maybe your driver level isn't high enough to get other cars for the level up, my ~840lvl. In any case, now two Cadillac Escalade FE are sold at the auction house, time until the end 1 day. But they can not buy out immediately, you can only place bets until the end of the auction. I own the Bowler and for the Collector score it shows 160 (striked through) and +176. I don't get why you couldn't just add the Owned (garage) icon. If you just started playing FM, it is natural that your driver level is very small and for the Level Up you will be given not very valuable cars, but when your driver level grows, then you will be given more valuable cars including some FE-cars. To see what your driler level you need to go this way: select in the game --> Progress --> Achievements --> Compare with friends, choose one of your friends (from the left of the screen) and scroll page down a little and you will see where displayed your driver level and your friend. But don't worry about it, I've already looked at your driver level and it's 660lvl. This is a good level, which means that's not the problem. Then I don't know why you don't get FE-cars for the Level Up. Yesterday I got a 1991 BMW M3 Forza Edition for the Level Up. What about you? You got it? 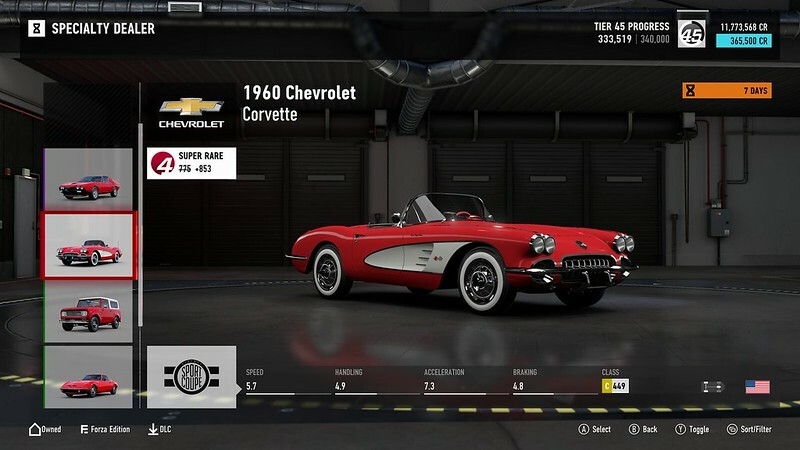 Earlier it was possible to receive for the Level Up: 1997 Honda Civic Type R Forza Edition and if I'm not mistaken 1988 Chevrolet Monte Carlo Super Sport Forza Edition, but no anymore. Now these are very rare FE-cars.